In general, there are three different types of onions available, and these can be grown by seed or by transplants which are sold in “sets”. Yellow: Yellow onions are the most commonly grown and used. Yellows are full-flavored and become much milder and sweeter when cooked. Red: Red onions boast a beautiful color and are often preferred fresh as they make a good presentation. They tend to be a bit milder in flavor than yellow onions. White: White onions are the least commonly grown onions. They are very pungent and full flavored, but they sweeten up when sautéed. 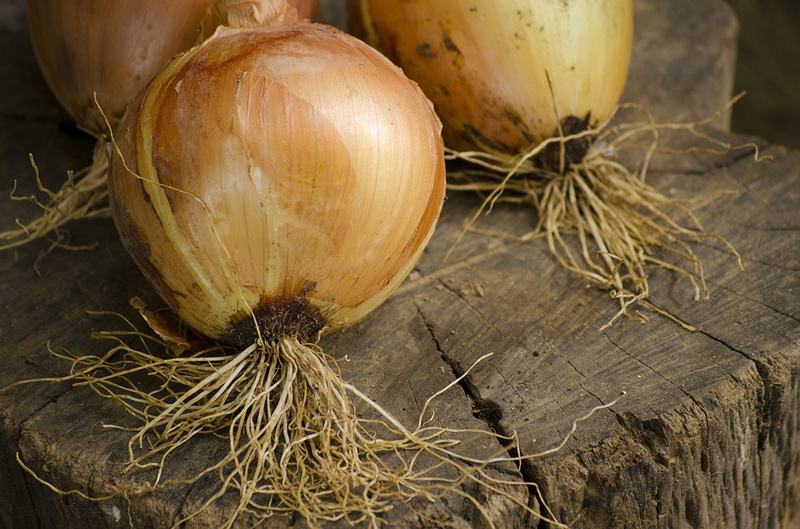 Onions prefer full sunlight, and well-draining soils that are loose and crumbly. If your soil is compacted, be sure to turn it well and work in compost or manure to loosen and enrich it. Onions prefer a slightly acidic pH between 6-6.8. Be sure to control weed growth, as they are competition for nutrients your onions will need. Pluck them by hand diligently, or lay down a layer of straw mulch to help prevent them from taking over the bed. Avoid planting onions in a bed that has previously grown onions, garlic, or other alliums within the last two years. This way, you avoid the potential of fungal disease. When planting onion starts, make sure there is at least 4” of space between each start, and 18” between the rows. Mix some compost into the soil, as well as an application of Bone Meal, which will help the onions receive the phosphorus that they need to grow strong roots. Plant them 1-2” deep, and water them in thoroughly. Onions have shallow roots, requiring about 1” of water per week, so they will need to be watered regularly. However, if you notice the leaves yellowing, cut back on watering. Three weeks after planting, apply some nitrogen-rich fertilizer such as Cottonseed Meal, Bat Guano 9-3-1, or DTE Agmino. Repeat every 3 weeks until a month before harvest when they start bulbing. Bulbing happens when the onions start to push the soil away, causing it to crack around the onion. Be diligent about weeding; onions do not like competition for the nutrients that they need. Mulching with straw can help with weed control, but must be pushed back when the onion starts to bulb. Slugs and snails enjoy munching on onion tops and can be an issue, but they are easily controlled by applying Sluggo in the onion bed. A couple other common pests you might encounter are thrips or aphids. They can be controlled by spraying the leaves with an insecticidal soap or neem oil. Onions are ready to harvest when the tops of the onion turn yellow/brown and fall over. This action pinches the bulb off from the leaves, and stops sap diverting to the leaves while the bulb matures. Stop watering at this point, allowing the soil to dry out. A good time to pull the onions is early on a sunny morning. Lay them out in the sun to dry for about two days. To prevent sunscald, layer the onions so that the tops of one row cover the bulbs of the other. They are ready for storage when the entire neck of the onion (where leaves meet the bulb) is dry, and doesn’t slide when you pinch it. The skin will be colored and textured uniformly. If the weather is damp or rainy, onions can be dried indoors, though it will take longer for them to dry properly. Once dry, clip the roots, brush off any remaining soil, and cut the tops back to 1”. Store your ready-to-eat onions in a cool, dry, well ventilated location. Place them in mesh bags or netting so they receive air flow. This will prevent molding and rot. Periodically check for any soft onions, and remove them so they don’t compromise the others. The more pungent onions tend to store longer; sweeter onions, shorter. Use varieties with shorter storage capacity first.